Just after PAX, Stephen Totilo posted a video at Kotaku showing some gameplay of The Witness. This is video from the start of the game and shows some basic stuff, including a set of blue mazes mounted on poles and on walls, that the player must solve to proceed. I've seen mixed reactions to these mazes and to the gameplay shown in the video. Some people seem to have jumped to the conclusion that the game is going to be about solving simple maze puzzles, and thus not be particularly exciting. If that thought crosses your mind, all I can ask is to have faith. I wouldn't make a game about solving a series of rote puzzles. The footage came from the beginning of the game because we don't want to spoil anything major. But even this beginning-of-the-game stuff has more to it than meets the eye. It's like Braid, in a way. Back before Braid was released, I never made a trailer video for it, because I couldn't come up with a way to show in video form what the game was about. You can show some rewinding happening, or other funky time stuff, sure, but what is cool about Braid is not the mechanics of those things or how they look on the screen. What is cool about Braid is what happens in the player's mind during the puzzle-solving process. The time stuff is the method by which that is implemented, but the rules of time manipulation do not contain the magic. Watching a video, it's nearly impossible to see the magic. You have to play the game to see the magic. The Witness is like that too. 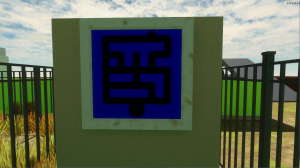 The blue mazes are a major aspect of the game, but they are not the point. The point is the magic that happens in the player's mind when he understands the subtle things that the mazes are saying -- because the mazes aren't just puzzles, they are lines of communication that aggregate, become more complex and eventually say surprising things. This can't be seen in a video; you have to play it to have the experience. The magic is in the player's head, not on the screen. The only two guys who have played The Witness to completion have said it will be better than Braid when it is done. I am certainly not going to jump up and down and say "hey this game is better than Braid", or even claim that Braid is good. But I just want to put that out there as reassurance to those of you who are worried about that gameplay video. I have a file with about 80 game ideas in it, most of which would probably make really good games. But I can only make one game at a time right now, so I had to pick one. I picked The Witness, even though it more difficult and expensive to make than most of the other ideas, because I was more excited about the core concept of The Witness than about the other 79 ideas. This is a highly ambitious game that stretches my ability as a game designer to its limit. And whatever you think about what you've seen so far, I'd like to thank you for your interest in the game! A new lecture about game design. While I think that you needn’t be this apologetic, I think you’ve done a good job illustrating your honest thoughts on the subject, and for smaller developers that’s the most important thing to keep intact. Congratulations on seeing this idea through to completion; I personally have confidence that it’s going to be a success, regardless of its critical acclaim, based on what I’m reading here. Can’t say I blame you for being careful about what you release about The Witness before it’s done. I’m not a big fan of sharing work-in-progress – even to people very close to me. (Actually – *especially* to people close to me). The kind of criticism you encounter at an early stage is not always helpful, even if it’s coming from good intentions. All the best with the game. To say The Witness is highly anticipated from all the fans of Braid is definitely an understatement. Yes. Still looking forward to the game here as well. I’m glad for the relative lack of information on the actual game, despite checking this blog daily. “The only two guys who have played The Witness to completion have said it will be better than Braid when it is done.” — That lone sentence just made me raise out of my chair in anticipation. Promise me you’ll include a soundtrack as great as that of Braid and I’ll be happy. You are allowed to say that Braid is a good game. Thanks for the reassurance, I can’t wait for this game! It looks beautiful and interesting, I hope the graphics update doesn’t take away from the charm. It’s nice to have some ‘softer’ posts on this blog – in this case dealing with the agonies of the creative process – but I agree with Christopher that you don’t (shouldn’t) need to worry about asserting this kind of reassurance.. Are there *really* people who know anything about Braid or your other work who are expressing doubts about Witness at this early stage? That makes me /sigh a bit. Dont you worry I bought 2 copies of braid (4 if you count gifts.) and if this is half as good I’ll probably do the same, the only problem I have with the puzzles is that they are really ugly, but of course this is still alpha so Im sure you can rectify that in due time. Thank you for making it clear to the ones who doubted. I myself think that anybody who has played and understood Braid should have faith in you! I rrally can’t wait for it. But I wanted to ask on which platforms are you planning to release it? I was slightly muddled, but entirely intrigued when I saw the footage, but, coming from you, I was positive there was more at play here than met the eye. It’s a bit disappointing you have to make such a blog post, but hopefully it reassures, and clears some confusion. I really can’t wait to play this, and see what you are trying to say/do. I just hope that you can keep up your enthusiasm for the project when you’re, to reduce it completely, seemingly just now coloring in the lines. Or maybe it’s closer to painting a sketch? Braid was great Jonathan, finish The Witness before you release, even flash people do it. I trust it will be a great game. I cannot wait for this game to come out. Ever since Braid Im searching for something to put my mind to work the way Braid did. That game almost put me to tears, not from the puzzle solving, but the whole overwhelming experience of the thing. You are a gift to the gaming community. I am a bit worried that people might think you, the mind behind Braid, don’t get that games are only medium for experience, as Jesse Schell puts it. That said, I find it a bit amusing that you got this defensive even though the Witness is not even published yet. Anyway, I have complete trust on your design taste. Good luck with the finishing touches! I don’t feel like I am being defensive or apologetic or anything like that. It’s just that these blog posts / videos / etc are supposed to be communicating effectively about the game (even if just in a limited fashion right now), so if I feel like something is getting miscommunicated about the nature of the game, it seems best to fix that early on. I was excited about this from the first placeholder site. Definitely have high expectations (even after the video of the puzzles) of the gameplay being engaging and unique. The only uncertainty for me is what the game will look like, and who is responsible for that side of things. Braid has such a classy aesthetic, between Hellman’s art and the soundtrack. That said, The Witness is already very pretty. But so curious to see how the look will flesh out. are you crazy? i would never doubt you! i have listened to ALL of your talks, i have read …some of your articles @ numbernone! and i have played all your games. what ever thing you recomend i try. thanks to you and Braid i decided to get enrolled in programming, animation and physics. Braid got me intrested in mathematics and physic and programming lenguages (since it convinced me to be a game maker, and to make games you need heavy math) games can be more than entretaintment. you don’t need to be concerned, you don’t need to explain anything. just remain true to what you want to do, that’s the whole point of being indie, right? if you start thinking about what people want or expect, you might as well get a contarct with activision! Braid is the best game i have played, all the things you talk about are in it. its a example of how to make games, for me. the video from pax at kotaku looked beautiful, you really nailed down that middle-of-day-sunshine. you have a lot of followers, they are all waiting for your next game, they will spread the word about the Witness. and i am waiting for more examples of how to make games that are meaningful to people. just when i heard that your next game was 3D i got super excited, just to see how you deal with it and learn more things from a technical perspective. Actually I was incredibly intrigued when I saw all these mazes, precisely /because/ I assumed that there is more to them than what can be glanced. For a while I tried to figure out just what that might be, but since I couldn’t I’ll just assume that it’s something really clever that will blow my mind once I play the game. He is not being defensive, he is just putting people at ease that thought “this can’t be all there is, right?” when they saw that kotaku video. I have to admit that I was not wowed by the gameplay footage I saw taped at PAX. I will also say that it was absolutely baffling to believe that someone who designed a game as razor sharp as Braid could not have something else up his sleeve. Could Braid be a fluke? Yes, certainly, but its unlikely. The concept, both in narrative and gameplay, speak too clearly of creative vision. Creative vision leads to good things. Braid reminded me a lot of Portal in its design philosophy, for obvious reasons. For the same reason that I can not imagine Portal 2 to be anything but super duper, I cannot image The Witness to be anything but original and fun. Good luck with the game Blow, I’ll be a-buyin. I never doubted your creative skill, but I was confused by the new concept. However, judging the game by that very short, very early segment would be very unreasonable. After reading this post, I’m not just reassured, I’m extremely excited and intrigued. I don’t need to see a single video or screenshot after this. One of the reasons I thoroughly enjoyed playing Braid was how I never saw a single video of the game beforehand. Your attitude and confidence is certainly a good sign. Best of luck to you, Blow. I just know that I’m gonna enjoy a game that focuses on player experience more than anything else. Braid was a truly excellent game. I was puzzled by the gameplay video of The Witness, it looked too simple, almost like you were doing an easy “casual” game, you know like the hidden object games that are popular among older women. I work making those games and I don’t like them too much. I assumed there had to be more to the blue puzzles. Thanks for clearing that out, now I’m looking forward to this game even more. I really, really, really loved Braid. You probably heard it a million times before but I love that game. I love you man. Keep making more games. If I was a billionaire I would shower you with money. Mr. Blow, I just want to say thank you for challenging yourself. It’s game designers like you and Suda51 that still make me excited to play videogames because you’re not afraid of choosing the harder route and doing something risky. And even more than that, you’re about more than just making a fun game, you ACTUALLY want to deliver an experience to the gamer, to make them feel or see something. And through that goal, you challenge me as an intellectual and a gamer and no one seems to care to do that anymore. I felt it was extremely important that I leave this comment so I hope it gives you more confidence in the games you make and what you want to achieve as someone who makes games. Thank you again for your effort. I hope that’s right,many people as possible deserve to be able to play this,imo. We haven’t decided on the release platforms. Xbox 360 and PS3 are possibilities. PC is very likely. The game might play well on the iPad or similar devices. Something smaller like the iPhone, I dunno… I don’t think the game would port well to a tiny screen like that, and it would likely not be playable. thanks very match for the current info. Dear Jonathan, I have a question. I listened to one of your talks where you talked about the touch screen panels and about ideas connected to them. At some point you mentioned that you had to make the “original” idea deeper or something like that. Does that mean that the touch panel idea “overshadowed” the original idea for the witness, which had gotten you started in the first place? Thank you for answering – I respect fully what you’re doing. Actually it’s the opposite. The original idea was strong, but the touch screens came into the game design, and I wasn’t sure that they were going to be deep enough. But then I started working on them, and they turned out to be very deep and have tons of interesting stuff. But they haven’t overshadowed the original idea, which is still in the game very strongly. Braid was such a work of art that I’m not worried one bit about how The Witness will turn out. People have a hard time visualizing a demo beyond what they see with their eyes and shouldn’t pass judgment yet. I can’t wait to play this game. You should learn how to live for another 100 years to make all of the games on your list. first of all – thank you for responding to this – I really appreciate the time. I think it’s quite amazing what is happenging here – even on the blog I was able to find and feel certain mystery regarding the game. When I looked at one of the screenshots I saw a tower. And close to the tower is a couple fo mazes. It’s interesting, since the mazes seem to have some spatial similarity to the touch screens. Also, in one of your talks you mentioned that since you first build a prototype out of blocks, it lets you see things fast – for instance what shadow and light could look like in the mazes – which is very interesting. The reason I am writing all this is that I am a game developer who has made a couple of real simple games. But I need to move on and want to create a “bigger” and “meaningful” game. I’ve been searching for the idea but am not able to find anything inspiring. I stumbled upon this blog and I must admit I am thinking that whatever I come up with won’t be nearly as good as your game. I am not in this for the money. I have money. I want to create something I’ll enjoy and don’t want it to be another FPS or strategy. I’ve listened to maybe all of your talks on the Internet. And I’m discovering there’s something very strong that you are saying: “Think of us as men who built telescopes and microscopes” – this is very deep and your suggestion to make a system that will help reveal some universal patterns of the universe is too. I am trying to search for such an idea but am really struggling. Do you please mind sharing a bit more on how to approach this? If possible, I’d like to get in touch with you, I believe you can see my e-mail address. I already feel reading about the witness has given me something I can’t describe. And the game is not even ready yet…. Something amazing’s going on here, I can feel it. Looks beautiful ;). The same desolate and mysterious island feeling that Myst captured so well. Do you have a blog where u write about your design process? I would be very keen to read it. If not, it might be a good idea to start one. Writing things down might get u to different places and other people might have some inspiring input. Maybe it helps to think of something u really like, then ask yourself why it is exactly why u like it and try to convey its essence into an abstraction that u can port to something else. For instance i like sports, i have played football (soccer) and the aspect i liked the most was the special moment of looking into the eyes of a teammate and connecting on a intuitive level. You know what he is gonna do, and he knows what u will do, and u know what your opponent will do. All tough diverse in content, many team-games capture this same feeling, at its most abstract one finds it in a game of rock-paper-scissors. So in its essence the attraction i talk about is a mind game where u try to predict the future. And the connection with someone else is brought about when u predict the same future. My suggestion is to focus on the things that you want to evoke in people’s mind and/or body first, and then think about a suitable way to achieve this with the use gameplay and in doing so discover how exactly the idea can be communicated in better and/or in new ways. Please, please, don’t make this an XBox 360/PS3 exclusive. I hate it when I have to miss great games like Limbo because I don’t own these consoles due to some big company paying the developers for exclusiveness. I haven’t played Braid yet, I just got it and haven’t found the time. I saw a gameplay video of Braid, and I didn’t get it, it looked interesting but not that special. However, I’ve been a gamer for a good many years now, and I can’t think of a time in my life when I’ve heard so many people rave over a game from such a wide swatch of the public. Many people I know who don’t play games played and loved Braid, and so did gamers. That’s quite an accomplishment. I also read an interview with you a week or two ago, talking about game development and where so many developers go wrong, or rather just don’t take the time to go right. I understood what you were saying there and I appreciate you for saying it and for not doing the same thing as so many other developers. You also talked a little bit about The Witness in that interview and between that and what you had to say about development in general, I was intrigued. Then I stumbled across this early gameplay video and watched it. If I just watch that as an in-development gameplay trailer, it looks pretty but it doesn’t look that special. But when I look at it within the context of what you said in that interview and how I saw people reacting to Braid, it’s a totally different experience. I’m fascinated, and I can see so much potential even in that video. I’d pay for the game right now if only for the assurance that I won’t somehow overlook it when it’s completed and released. I think for a game trailer when it’s ready to be released, you might start out with something saying “What is The Witness? It’s not something you can communicate with words or video. The Witness is more than that. It’s something that must be experienced.” Intersperse some gameplay footage in amongst those lines so people know what it looks like, and then spend the rest of the trailer showing the faces and reactions of some people actually playing and experiencing the game– as they’re “getting it.” That’s probably the best bet, since it seems like you’re not giving people game mechanics, but an experience via those game mechanics. So to show people what the game is all about, communicating the game mechanics isn’t the way to do it, communicating the experience of it is. I think people will be able to relate to that. I’m looking forward to it when you get it finished. Probably more than any other game on my radar at the moment. It sounds a little like The Longest Journey crossed with Lost and Myst, but with a little Zen sprinkled on top. I think it’ll be a rare and beautiful treat. @ Keith D.: i agree! : D that sounds like a good idea for a trailer… and that interview you mentioned sounds really cool… would you link to it. From what I saw of the first few puzzles in the video, they looked like standard mechanic-teaching devices to me. What I learned was: on the blue panels you start from the larger circle node and trace to the little yellow pulsing node. When you’re done, cables illuminate and guide you to newly-activated blue panels, and sometimes they open doors. The language of the game was clear from those few moments. From that little bit of teaching, the logic behind the puzzle that the player was struggling with at the end was simple to understand, and it was easy to see how further complications could add up to some interesting and challenging problems.